Healthcare economists talk a lot about something they call the Iron Triangle of Healthcare. It’s a vivid description of the trade-offs involved in maintaining high quality care while simultaneously keeping costs contained and making care available to as many people as possible. The basic idea of the Iron Triangle is that you cannot address one of the three dimensions without effecting one of the other two. That is, for example, you cannot make care more affordable or available to more people without sacrificing quality. Something must give. Compromises must be made. 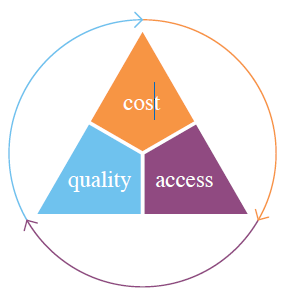 The Iron Triangle can be applied to hearing healthcare and the role audiology plays in the broader healthcare system. The way you wish to shape the Triangle depends on your perspective. If you take a public health perspective, it is likely that you are familiar with all the evidence suggesting untreated hearing loss has several significant consequences, such as an increased probability of acquiring dementia or depression. You are thusly motivated to reduce costs and increase access to hearing aids – an intervention likely to ameliorate these conditions, but at the expense of not completing a comprehensive audiologic evaluation on every individual with hearing loss prior to buying hearing aids. You may even be in favor of an over-the-counter solution designed to reduce costs and improve access, but sacrifices quality. Alternatively, if you view the Iron Triangle from the vantage point of a diagnostician working in a medical center, your chief priority might be to ensure any individual coming to see you for an assessment receives an exhaustive evaluation that accurately pinpoints any possible medically complicated otologic condition that could prove catastrophic. From this perspective, you’re willing to live with a relatively substantial number of people not being able to afford or have access to hearing aids to maintain a regimented (and costlier) approach to finding and treating non-benign ear disease. The main point to be gleaned from the Iron Triangle is trade-offs are inevitable. Audiologists can’t be fooled into thinking there is one correct answer to the problem of unmet need among hearing impaired adults when the answer depends on your view of the Iron Triangle, and how you want to allocate a finite amount of resources. At the end of the day, it comes down to what trade-off are you willing to make? An honest dialogue about the risks and rewards of recommending over-the-counter hearing aids starts with how you view the Iron Triangle of Hearing Healthcare. Source: Medicine’s Dilemmas” Infinite Needs Versus Finite Resources. William L. Kissick, Yale University Press, 1994.